Can someone please come over here and explain to me how we've already had our first 95 degree day!? I'm SO not ready for this crazy summer heat, but it's definitely my favorite time of year when it comes to style! Warm weather is a laid back girl's BFF, and after going flower shopping on a super hot day with my mom and Emmy, I found out it's my favorite season to dress Em for, too! Simple looks are totally embraced this time of year, which y'all know is right up my alley! I've put together a little list of things that are total essentials in my closet for warm weather + some of my must-have basics that you can wear all year round! This might seem like a no-brainer, but you really can't have too many basics! I feel like I'm always buying these, but all tees + tanks are definitely not created equal. 🙈 Plus, it's totally necessary to have options so you can style them with jeans / maxi skirts / comfy shorts / over the top of a sundress ... the list goes on! 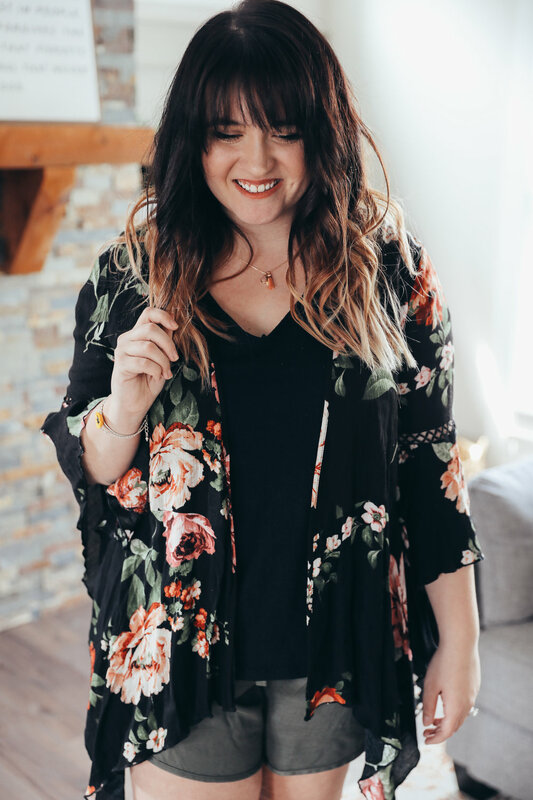 If there's one thing I've probably bought too many of already this season it's floral kimonos. 😂 They're just so effortlessly cute! They immediately dress up any cozy look (click here for the one I'm wearing in these photos! ), and they always make me feel more put together. They're super versatile, too! I use mine as a beach / pool cover-up, and they work perfectly as a light nursing cover when we're out! My favorite part about warm weather is getting to pull all of my dresses back out! Sundresses, maxi dresses, t-shirt dresses ... They're seriously the BEST part about getting your closet ready for spring + summer! You can dress them up or down, and it's so effortless to just throw on a cute dress and walk out the door. I started buying comfy shorts a couple of years ago for a beach trip, and I never looked back! Especially as a stay at home mama, these things are lifesavers! They make it super easy to get dressed for the day without feeling like you're truly "getting ready", you know what I mean? Click here for the ones I'm wearing in this post! As someone who used to design graphic tees, it's safe to say I have plenty of these in my closet. 😂 You really can't beat a good graphic tee, though! I love layering them on top of a sweet sundress to add a little extra edge and to mix things up a bit! Way back when, I was queen of statement jewelry. Who else remembers those J. Crew bubble necklaces? 🙈 I wore one with EVERYTHING. I've since realized that statement jewelry isn't really my style ... not to mention the fact that Emmy would be pulling everything off of me until it broke. 😂 I need all of the dainty jewelry in my life! I've been more intentional lately with the jewelry I'm buying ... I'm putting together a collection of pieces that I really love that I can wear everyday (and will last for years!) vs buying a ton of different ones that I'll probably end up losing.